Successfully Added IP66 Outdoor PTZ Dome Camera - 1/4 Inch CMOS, Pan Tilt, 20m Night Vision, IR Cut, Motion Detection, Remote View, 3 Times Zoom to your Shopping Cart. This weatherproof PTZ camera is the perfect tool to keep an eye on what’s happening around your property. Fit for both private as well as public use this IP camera helps you to monitor your house, office buildings, parking lots, factories, school halls, public areas, shopping malls, and more. Recording footage in 1280x720 HD resolutions this PTZ IP camera features a built-in motor and can be controlled from afar. The camera can pan through 355 degrees and tilt up to 90 degrees – guaranteeing that nothing will escape its view. With its plug and play design this security camera is extremely easy to install. Featuring a 1/4 inch CMOS sensor this dome camera records HD footage in clear and sharp quality - allowing it to record the finest details. Its IR cut technology switches automatically in between regular recording and night vision recording when natural light becomes limited. With 6 integrated IR LEDs this night vision security camera is able to record clear images after dark and can recognize objects up to a distance of 20 meters away. A 2.8 to 12mm lens provides 3 times optical zoom, allowing you to get a closer view whenever it’s needed. Supporting motion detection and alarm functions this IP camera can be set to track four detection areas. When motion is detected in the pre-set area an alarm notification including picture will be automatically sent to your smartphone or e-mail, updating you about your property’s security status no matter where in the world you are located. Supporting all the major internet browsers as well as iOS 7 and Android 4.0 and above this security camera can be efficiently used on the majority of PCs and smartphones out there. Its online system supports 13 visitors at once, allowing you to grant access to your security software to multiple persons to ensure that everybody will always be up to date. 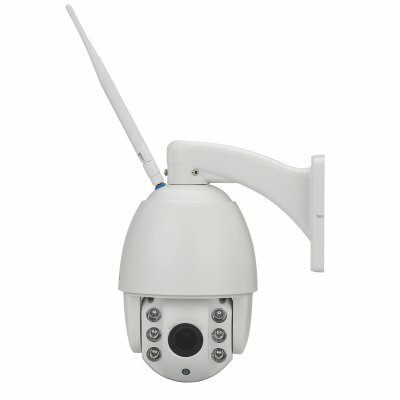 Being IP66 rated this waterproof PTZ camera is fit for both indoor and outdoor use. Rain, snow, fog, or ice – no matter the weather conditions this security camera will do its job. With its built-in 8GB TF card footage will be automatically stored, ensuring you that not a single important moment gets lost. Small in size yet immensely powerful, this HD security camera offers a great tool for you to protect your property and loved ones at any time of the day. This IP camera comes with a 12 months warranty, brought to you by the leader in security cameras as well as wholesale electronic gadgets..
Arabic: - في الهواء الطلق بتز الأمن الكاميرا - Chinese Simplified: - 室外云台摄像机 - Czech: - Venkovní PTZ bezpečnostní kamera - Dutch: - Buiten PTZ Security Camera - French: - Caméra de sécurité extérieure PTZ - German: - Outdoor PTZ Überwachungskamera - Hebrew: - מצלמת אבטחה PTZ חיצונית - Hindi: - आउटडोर PTZ सुरक्षा कैमरे - Hungarian: - PTZ kültéri biztonsági kamera - Italian: - All'aperto PTZ telecamera di sicurezza - Japanese: - 屋外 ptz カメラ セキュリティ カメラ - Korean: - 야외 PTZ 보안 카메라 - Malay: - Kamera keselamatan PTZ Kolam - Norwegian Bokmål: - Utendørs PTZ Security Camera - Romanian: - Camera de securitate în aer liber PTZ - Russian: - Открытый PTZ камеры безопасности - Spanish: - Cámara de seguridad PTZ exterior - Thai: - กล้องรักษาความปลอดภัยกลางแจ้ง PTZ - Turkish: - Açık PTZ güvenlik kamerası - Vietnamese: - Hồ PTZ Camera an ninh.